Those in the military wear tactical boots for long hours in unpredictable conditions. If military boots can handle tromping in the desert and swamps during combat, they should be tough enough for your long treks outdoors. We'll show you what to keep your eyes out for, along with our picks for best tactical hiking boots in 2018. **Below, you'll find our detailed reviews, but you can also click the links above to quickly check the prices of our top 3 picks for the best men's tactical hiking boots in 2018. Top-rated tactical boots, to include Special Forces boots, are built for all sorts of terrain and conditions, making them an option to consider when seeking footwear for hiking. As when choosing any tactical wear, there are factors that you want to think about when choosing the pair of tactical hiking boots that best suit your needs. First, think about where you will be wearing these boots. You will likely want a different boot for rocky adventures in the desert than you would want if you plan to hike through the rugged moun﻿﻿tains or in swampland. Also consider the temperatures that you will encounter where you plan to be hiking. Will the temperatures be extreme; either hot or cold? Do you anticipate a lot of wetness, whether because you are traversing rivers or swamps, or spending time outdoors in rainy conditions? It is helpful to understand the different parts of a tactical boot, along with the different types of materials they can be made from. You will want to choose the type of material each part of the boot is made of based on your planned usage. Boots include the “upper”, “midsoles” and “outsoles”. The top portion of the boot is considered the upper. Uppers can be made out of a variety of materials and the choice of material will impact the weight, breathability, durability and water-resistance of the boot. Most boots are made of full-grain leather. While leather may lack breathability and take a while to break in, it will do well in its resistance to water and will be very durable. Real leather is good to have when traversing rough terrain, particularly with heavy loads over a long period of time. While full-grain leather may take awhile to dry, split grain leather is a combination of leather and nylon which will weigh less and breathe better than full-grain leather. Usually cheaper than full-grain leather, split grain leather will not be as water resistant. Nubuck leather is buffed leather that looks like suede. While it is similar to full-grain leather, it is typically a bit more flexible. Synthetics are another material option for the upper. Synthetic options include polyester,nylon and synthetic leather. These options break in quicker and are lighter and dry faster. They are also cheaper. The negative is that they will wear out faster than leather boots. Waterproof tactical boots are typically synthetic. Midsoles have multiple functions, from cushioning, shock absorption and being responsible for how stiff (or not) the boot is. Midsoles are usually made of Ethylene-vinyl acetate (EVA) or Polyurethane. EVA feels lighter and like it has more cushion. EVA is cheaper than polyurethane and is used more often. It works well as a shock absorbent, is waterproof and does a good job protecting your feet from sharp objects. Polyurethane is more firm and durable than EVA,however it is more expensive. 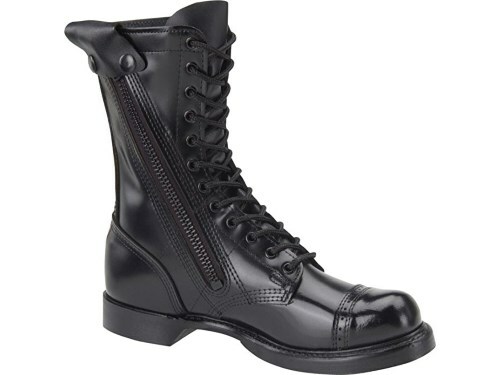 Most soles for tactical boots are made of rubber. In some boots, carbon is added in order to add additional stiffness. Made in Italy, Vibram soles are ahigh quality sole that is resistant to a number of substances, is slip resistant and is lightweight and durable. Learn more about Vibram soles in the video below. Other parts of the boot to pay attention to include the heel break, lug pattern and toe protection. A heel break is the part of the outsole that will slow you down when you are descending from a steep location. The lug pattern will provide you with traction; in places that are swampy or littered with debris, a smaller lug pattern will ensure that small items don’t get caught in your boot. In regards to toe protection, tactical boots may have steel or composite toe protection. Gore-Tex, or GTX, is a membrane with many microscopic openings that is coated with Teflon. GTX is developed to keep your feet dry, both by keeping moisture out, as well as eliminating sweat that you generate. The most common types of tactical boots include jump boots, tanker boots and tactical boots for extreme weather conditions. Standard issue boots are your basic army boots. They are waterproof, made of black leather and are developed to offer additional stability in the ankle and foot. As they are made for training or combat conditions, they are made to handle rough terrain. Jump boots are also called paratrooper boots. 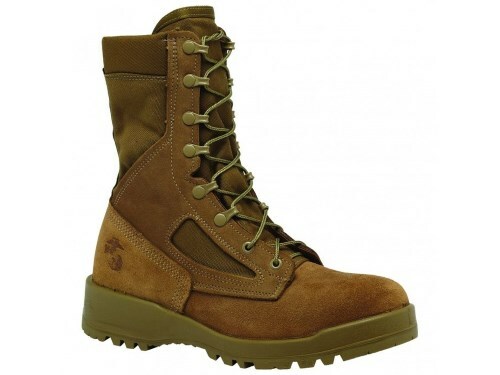 These are standard for those in paratrooper units and offer reinforcements, particularly in the ankle, making them a good option for military hiking boots, especially for those who spend a lot of time on uneven terrain. Including tall shanks that reach the calf and rubber soles, jump boots offer protection and stability. Tanker boots don’t have laces, instead featuring leather straps. This is so that the laces don’t get tangled up with anything; from moving parts of a tank to tree roots. These boots are very heat resistant, offer a gusseted tongue to keep debris out and have steel toe guards and metal inserts. Tactical boots for weather extremes include Jungle boots (uppers made of canvas with rubber soles, which let water in but dry out very quickly), Desert boots (made of rough suede along with nylon siding) and Combat boots for cold climates (thereare a variety of these for different temperature conditions). Now that you have an idea of what to keep in mind when looking to purchase the best pair of military hiking boots around, let’s review six possible options of top-rated tactical hiking boots. When looking for a pair of tactical boots for hiking, one option to consider is the Corcoran Men’s 10 Inch Side Zipper Jump Work Boot. Consisting of 90% full grain leather and 10% mesh, these boots are made for dropping into war zones, making them a viable option for leaping across creeks and boulders. The specially designed paratrooper ankle webbing support and ribbed steel paratrooper shank will instill confidence that these boots can deliver the support you need when in rough terrain. Of course you want to be comfortable during hours on the trails; fortunately, these tactical boots offer PORON shock absorbing insoles, keeping your feet happy regardless of the conditions you encounter. These tactical hiking boots by Corcoran offer military style and are made to take a pounding, making them are a good match for all types of outdoor adventures. As these boots are not lined, they could be a poor choice if you are planning to do a lot of hiking in cold temperatures. When you are looking to move quickly in the outdoors, the Garmont T8 Bifida Tactical Boot will be able to keep up with you while you explore. The suede leather upper includes nylon mesh for breathability; that ventilation is a real plus for dealing with the sweating that is bound to happen while you make your way up a steep, rocky incline or maintain a quick pace over a flatter trail. Made of quick-drying materials, these boots are a good fit for wet climates (0r crossing rivers); you won't have to worry about them remaining wet for long. 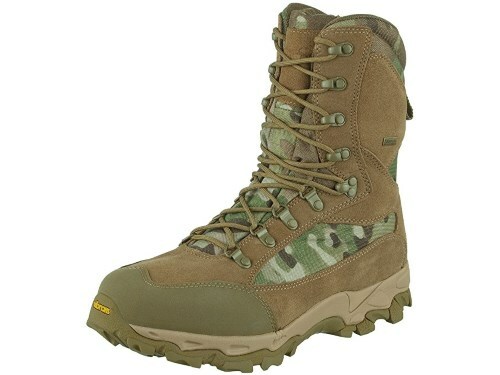 Available in medium and wide widths, these tactical boots by Garmont will deliver the comfort and protection you hope for during long treks and when carrying heavy loads.Texon and canvas reinforcements are a big part of their durability; there will be no need to worry that the rough terrain that you love will destroy your boots. The Garmont T8 Bifida Tactical Boot has the versatility necessary for a variety of adventures; to include day hikes in wet conditions to a weeklong backpacking trip with a heavy pack. These tactical boots by Garmont tend to run narrow. Those with an average width foot may want to try the wide width to obtain the room needed for comfort when walking a significant number of miles. If you have a wide foot, these may not be the boots for you. 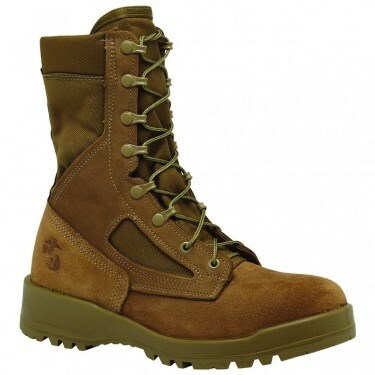 When seeking a highly dependable tactical boot that can keep your feet dry when crossing a river while enabling you to move quickly on both rocky and smooth terrain, take a look at the Belleville 500 USMC Waterproof Desert Tan 8” Combat Boot. Designed by Belleville Shoes with the input of the special forces community, these tactical boots were made in part by those who actually use them, something that immediately piques my interest. The Vibram outsole ensures stability and performance; key necessities when tromping in the woods, jungle or desert. Available in regular and wide widths, the upper is made of full-grain cowhide leather along with Cordura nylon fabric. With a cushioned polyurethane insole, these tactical boots by Belleville will feel comfortable when spending hours on your feet no matter the ground conditions. As far as tactical hiking boots are concerned, the Belleville 500 USMC Waterproof Desert Combat Boot is ready for any action ahead of you. he Men’s Marine Temperate Military Boot by Danner is a rough-out full-grain leather upper that is built for durability and comfort no matter how challenging the conditions they are asked to perform in. In harshconditions you want protection (not just from the elements but from critters) and these tactical boots by Danner will offer that through lightweight 1000 Denier nylon and triple stitching.Gore-Tex lining will keep your feet dry and comfortable over long days on the trails. Traction is important when making your way up and down steep inclines.Fortunately these boots offer a Vibram Sierra outsole which will offer traction and stability in multiple types of terrain. The lace-to-toe design will help you to achieve a personalized fit and the speed lace fastening system will keep you moving without long stops to adjust your boots. These tactical boots by Danner will meet your needs and keep you comfortable as you explore all that is before you. When you are looking to tackle different types of outdoor adventures, the Viper Elite 5 Boots will provide you with the protection, support, comfort and durability that you are seeking. Planning to spend time in very difficult conditions? These boots by Viper are ready; they are made of ahigh quality cowhide suede leather, along with 1000D Cordura fabric and a rubber sole and will stand up to any conditions you encounter. Worried about slipping into some water (or want to run through a creek)? Ahydroguard waterproof membrane ensures that your feet remain dry when coming across wet conditions. Rubber toe cap protection is ideal for those times where you encounter rocks and tree roots whether on or off the trail. Support for your feet and ankles is imperative during your adventures. 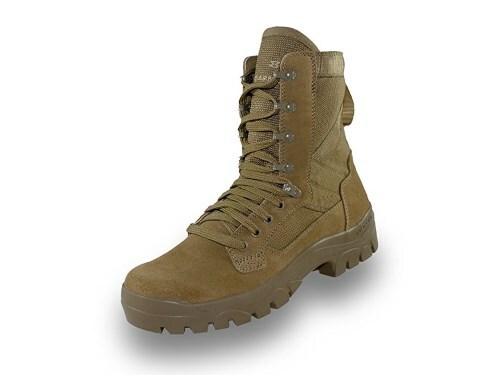 Offering 9 eyelets, the fit of these tactical boots by Viper can be customized to offer the stability you need. Seam-sealed to offer the most protection possible, these tactical boots by Viper will stand up to all in their path. 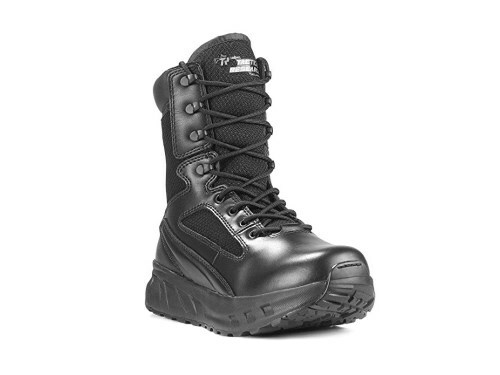 Offered by Tactical Research, the FATT MAXX 8ZWP Side Zip Waterproof Shock Absorbant Boot delivers comfort and high performance no matter how challenging the terrain. Made of leather and rubber and offering a Vibram sole, these tactical boots have an excellent grip which is important for exploring on uneven and slippery surfaces. The Fatt Maxx midsole offers foam that is higher in volume, with a softer density and more significant rebound than your standard tactical boot. This will allow your foot to sink to a greater depth in the midsole, increasing the support and stability and ensuring your steps are as uniform as possible. Those uniform steps are key to avoiding pain in other areas of your body. Not only waterproof, but bloodborne pathogen proof, these tactical boots by Tactical Research offer plenty of protection from the elements and more. The midsole of the Fatt Maxx offers increased comfort and support of your foot, ensuring that it remains stable and that you remain comfortable. When using these boots for hiking you may not be following orders, but that does not mean you want to have to turn around as a result of sore feet. 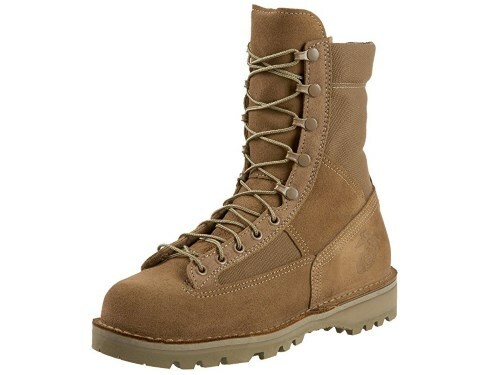 The Belleville 500 USMC Waterproof Desert Tan 8" Combat Boot is our top choice. Developed in part with those who have been involved in Special Forces, this tactical boot delivers excellent features like the Vibram outsole and Gore-tex waterproof fabric bootie. With the Vibram outsole you will have the traction that you want to move quickly down a steep and rocky incline with total confidence. As far as the Gore-tex waterproof fabric bootie, let's be honest; sometimes we want to take a few steps in the creek (no accident required) without it meaning we will have wet feet for the rest of the day. When looking for the best tactical hiking boot, the Belleville 500 USMC Waterproof Desert Tan 8" Combat Boots are up for the adventure.